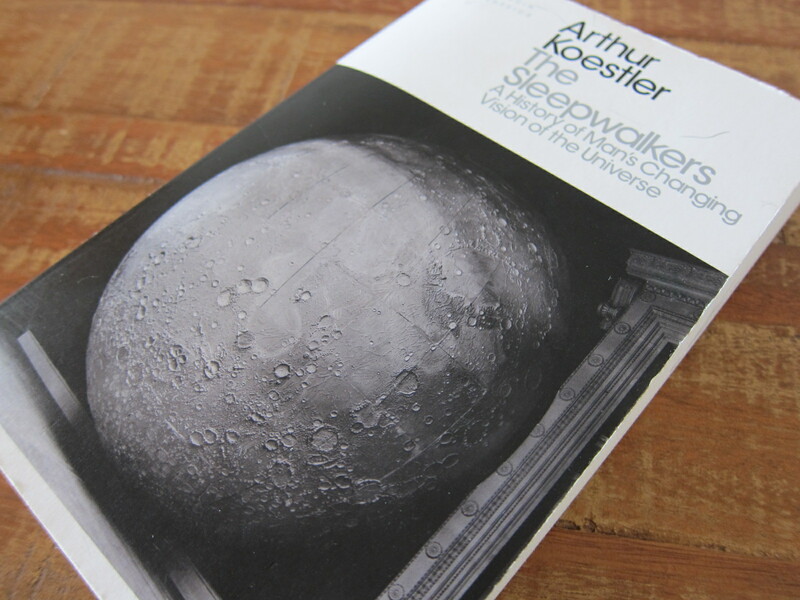 In a couple of previous articles I have mentioned that I have been reading and enjoying immensely Arthur Koestler’s The Sleepwalkers: A History of Man’s Changing Vision of the Universe. Koestler’s writing is vivid, compelling, and in many places entertainingly opinionated in his telling of the story of how we came to understand the universe in all its vastness, starting with Pythagoras, Plato, Aristotle and their contemporaries, and then moving to a focus on Copernicus, Kepler and Galileo. Not only did the sun replace the earth as the centre of our own galaxy, but the perfection of the heavens with planets orbiting on fixed and perfect wheels gave way to a terrifying conception of a universe of infinite dimensions, random, chaotic, and unordered. The great discoveries of science often consist in the uncovering of a truth buried under the rubble of traditional prejudice, in getting out of the culs-de-dac into which formal reasoning divorced fropm reality leads: in liberating the mind trapped from the iron teeth of dogma. Koestler’s take on Copernicus is so compelling and brilliant and also just so so unfair I don’t know how I feel about it. I did stimulate a lot of great Copernicus research though. On the other hand, his opinion that Galileo had no friends and was unloved in his time is just stupid. And his implication that Kepler went mad and abandoned his family at the end of his life bothered me a lot too (after reading more on the subject) in part because I feel like Koestler was projecting his own (outrageous) misogyny on the character he identified with best. So what to do? Would I recommend you read The Sleepwalkers? Absolutely yes. 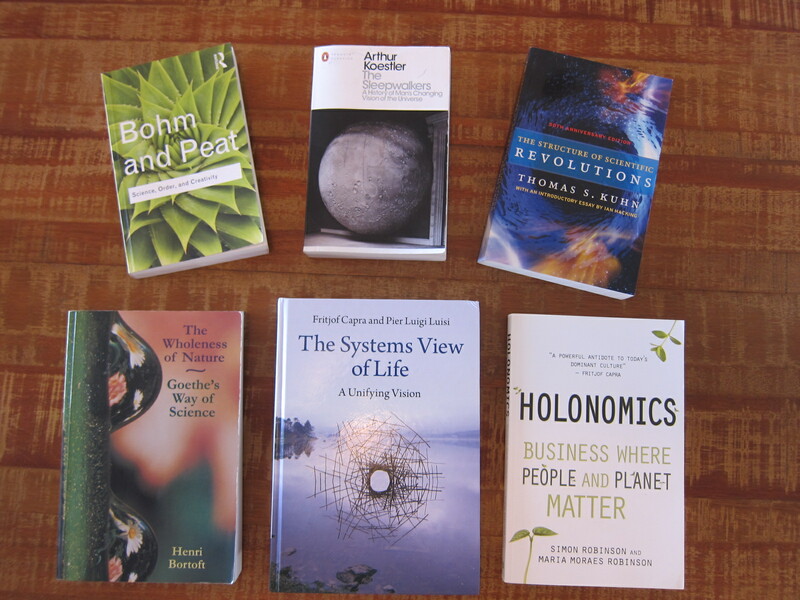 The but comes in the form of reading it in the context of these other books which take us on a journey, one which starts with dogma, directs us through the shifting and dangerous quicksands of paradigm shifts, before arriving at what Henri Bortoft described as ‘constructive conceptions’. If I could summarise the greatness of Henri’s life work, it would be his ability to articulate the great discovery of philosophy at the beginning of the twentieth century, which was the intrinsic wholeness of lived experience, not experience as it has been lived (past tense) but experience as lived (present tense). For example while in being in Time, book 1 division 1 Heidegger described experience in an entirely holistic way, this discovery is only now beginning to be fully understood and appreciated. The late Brian Goodwin, a mathematical biologist, a great friend of Henri’s introduce the term ‘holistic science’ but this does not describe a single science, but to a number of areas in science where wholeness is an important factor. These sciences have family essences (to borrow a concept of Wittgenstein). 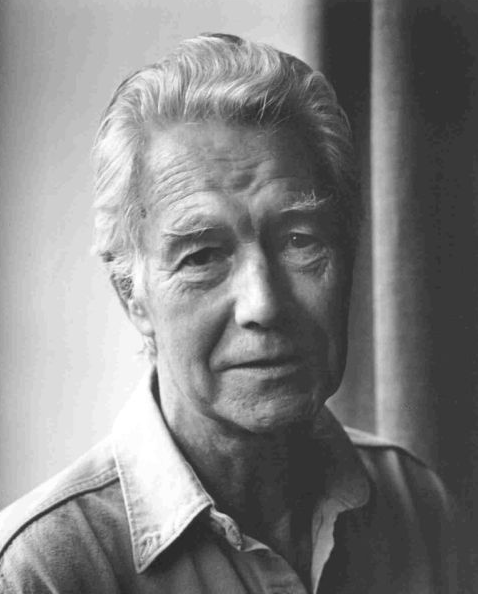 Brian saw for example in morphogenesis and embryology, where he saw that there were features of wholeness in the development of organisms which were not taken in to account in atomistic and analytical science. After developing an interest in non-linear dynamic systems, Brian realised that the features of wholeness discovered in these systems could also be relevant in understand our conception of life and living systems. The final area that Brian developed a great interest in was the phenomenological scientific method of Goethe, and taught Goethean science together with Henri. In our book Holonomics: Business Where People and Planet Matter we describe these three sciences, and as Henri pointed out, they all have a holistic side to them, where wholeness features strongly, not a single common essence but a family resemblance. We can take this concept of family resemblances into the whole of science, and see that there is no such thing as one single science. There are family resemblances between things called sciences. While philosophers such as Rudolph Carnap from the Vienna Circle in the 1920s did strongly advocate reducing the sciences to physics as their common core, it was eventually found that this does not work. Nowadays science has proliferated so much that people work in which ever way they work in accordance with the field in which they are they working, and different regions of nature seem to have differently appropriate ways of working. The great lesson we can learn from Galileo and Aristotle is the importance of disagreement in science. There is a danger that collective consensus in science is over emphasised. For Henri, science is all about creative disagreement, since even though all people and institutions can agree on what has been achieved, it only takes one man or woman who have discovered something that “upturns the apple cart completely”. Although these people may be initially ignored and excluded, eventually science does change, if just one person sees differently, and they turn out to have more of the truth than the consensus had. This idea of consensus comes from the notion of paradigm, which Henri suggested was “fine in politics, where there is government by consensus, but which also happens in science”. As Henri said to us, before we can understand the history of science, we need to understand social psychology first, since this gives us a much better picture of what science is like. If we follow Henri’s teachings, while paradigms may work for politics, they do not work for science, although it is possible to “re-present science in such a way that it looks as if the paradigm story works”. In Henri’s evaluation, the best book written by Thomas Kuhn was his last, on black body radiation, but by this point even Kuhn himself had dropped the term paradigm, and “was glad to get away from it” since what he meant by paradigm was the opposite of what people thought he meant by it. Henri taught with great humour, and as he remarked, “please don’t anyone mention paradigm shifts to me. It has a funny effect on me”. If we gain a new paradigm we become like members of a new political party, like “little in-groups in a gold-fish bowl” with a strong sense of social coherence all swimming around in the same way. This sense of all swimming in the same directio0n gives both a string sense of belonging and also of being in possession of the truth. But this is just a consequence of the social situation in which you are constrained. And so science conforms more to a form of politics than of science. A great example of this happening is given by Mara Beller in the last two chapters of her book Quantum Dialogue: The Making Of A Revolution (Science & Its Conceptual Foundations). For Henri, the most most important thing to remember was that “nothing is what it seems”. If we do not want new paradigms therefore, what do we want? We want creatively thinking people who differ creatively. This means being open to each other, and this is what true dialogue is. Dialogue is not there to come to a consensus. It is much more dynamic. The idea of a constructive conception is that it is not the truth. A dogmatic annunciation says it is the truth. A constructive conception has in it sufficient truth for it to be useful to take you on [forward]. What you said, that you need to be aware that you are doing it, needs to be underlined in red many times. It is the most important thing of all. You do things in full awareness of what you are doing. Our problem is that we don’t. We do things without being aware of what we are doing. That’s when things become dogmatic and we become trapped in them. Creative conceptions as well as containing elements of truth, with also contain elements of falseness, and these too are useful, because when you become aware of the untruthfulness, you are then able to look at it and find a way forward, to take you further. Dogmatic annunciations simply say “this is true” and for most of the time we treat things said by people as dogmatic annunciations because then we can reply by saying “no, that is not true” and we are then able to argue. The solution is to look to the spirit of things, and not the letter of what is said. In understanding the philosophical works of others, you have to look to the spirit and not the letter in everything. This means trying to catch the intention of what people are saying, the spirit in which someone is saying something, and not in the actual expression of someone’s words. The point here is that in using words, it is often the point that what we say will contain distortions and will not necessarily be right. Henri met Hans-Georg Gadamer, who died in 2002 at the age of 102, and when they met when Gadamer was 86, Henri immediately saw in this great thinker a person who epitomised this approach. Gadamer said that especially in relation to written works, we should always attempt to take the other in their intention and not in their expression. But this is subtle of course, since we do not have access to people’s intentions, just their expressions. Although this is by no means easy, we can of course practice it when listening to what someone is saying, or what they have written. As Henri actually said of his own book Taking Appearance Seriously: The Dynamic Way of Seeing in Goethe and European Thought, he did no intend it to be a dogmatic annunciation since neither he nor anyone else has access to this level of truth, although many people think they do, talk as if they did, and treat other people as if that is what they were doing. So here is one key way in which we can learn to develop authentic dialogues with other people. We need to notice when we are treating people as if they are making dogmatic annunciations. If we can truly grasp the essence and intention of what these simple seeming insights are teaching us, then although we may not make the same level of discoveries as Copernicus, Kepler, Galileo and Newton, our own universes and the experiences we live will be dramatically transformed. A worthy venture indeed. ← Why Don’t You Just Switch Off Your Smart Phone and Go Out and Do Something Less Boring Instead?